You may have stumbled across the term “Nefertiti Lift” or “Nefertiti Neck Lift” or maybe “Jawline Jowl Lift” if you’ve done any recent online searches of facial rejuvenation or anti-aging treatment options. What are these terms referring to? Good question. 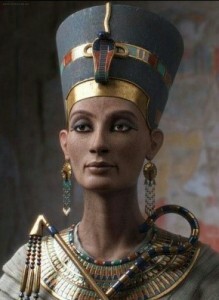 The Nefertiti Lift is named after the ancient (14th century BC) Egyptian Queen Nefertiti, who was known for her beauty, slender neck and elegant jawline. Her jowl-free and distinct jawline is a look that many people in our modern age want… and can achieve, without having to go under the knife. Our necks can start to show our age with a gradual accumulation of wrinkles and creases, along with sagging jowls under the jaw. A drape of neck muscles, called the “platysma”, tends to pull down on the skin of our lower jaw and face, compounding the relentless aging effect of gravity on our once-youthful complexions. For some people, a plastic surgery face lift procedure may be the only successful option. But for most, the Nefertiti Lift can create a beautiful “mini face lift”. The secret to this Nefertiti Lift is a fast and effective non-surgical treatment using injectable muscle-relaxers, such as Botox or Dysport. These are purified proteins that strategically relax specific muscles, preventing them from tightening/contracting for 3-6 months. The skin wrinkles created by those muscle contractions soften in appearance while under the influence of the muscle-relaxer, leaving a firmer, smoother surface. In the neck and jaw area, the relaxed platysma muscle pulls down much less, allowing the face, jawline and neck skin tightens. With each re-application of Botox or Dysport over time, any wrinkles and sagging skin in those treated areas will lighten and tighten, slowing down the skin-aging process that all the rest of us succumb to. This same effect is seen when using these injection treatments for eye wrinkles (“crow’s feet”), frown and scowl lines, forehead creases, “brow lifts”, “lip lifts”, correcting “gummy smiles”, chin de-dimpling and facial tapering (softening a square jawline). Using injectable treatments, like Botox or Dysport, can be fantastic alternatives to plastic surgery. Treatments cost $200 – $500 typically, with beautiful results lasting up to 6 months. Learn more about Botox and Dysport as well as what to expect at an injection treatment.